UNITED NATIONS, February 21 -- When faced with questions about corruption, the UN these days belatedly responds with generalize press statements which ignore the questions to which the UN is purportedly responding. Inner City Press: this Suntech Power, a Chinese-based photovoltaic company, announced that it has won a $180 million contract from the UN to provide panels, solar panels, I guess, to peacekeeping missions. I wanted to, one, if you could confirm it; it is a pretty big contract. Two, it doesn’t seem, this company doesn’t seem to be listed anywhere in the UN, in the vendor, approved vendor lists. And the CEO is apparently on the Secretary-General’s Advisory Group on Energy and Climate Change. So I am just wondering, were there any — if that’s the case, the final one — were there any precautions taken in the procurement? Were there other bidders? Can we have some presentation of how the contract was given and whether it’s appropriate, the way they announced it, and that they are not a listed vendor? Spokesperson: I saw the same press release as you did on my Google News Alert, and I have already asked my colleagues in DPKO/DFS for some background on that. Inner City Press: on that Suntech contract that came up, is it confirmed that the UN has granted such a contract? If it is through an intermediary, is it…? Spokesperson Nesirky: Well, two things, really. First of all, I saw the story, the same as you, and have asked for guidance on details, which obviously I do not have, because I don’t have details on absolutely everything that happens in the United Nations at my fingertips. So we have to ask to find out. That’s what we do. The same as you ask me to find out. And so we have asked and we are waiting for a response, which I believe will be coming quite soon. On the afternoon of Saturday, February 19 Nesirky or his office sent out an e-mail to the UN press corps entitled Note to Correspondents, but not answering the actual questions raised and not even mentioning Suntech, the Chinese company praised by USG Sha Zukang which publicly bragged about getting the $80 million UN contract. The request for solar panels was issued by the Department of Field Support, which provides logistics for the Department of Peacekeeping Operations. The solar panels will be used to supply electricity for communications equipment in remote locations, thereby reducing the need for generators, fuel and re-supply. It is part of the Secretary-General’s initiative of “Greening the Blue” and will reduce the carbon footprint of peacekeeping operations. The contract to Peak International was awarded as a result of a competitive solicitation involving 30 companies from 14 countries. Four companies submitted proposals, out of which three were considered technically qualified by the UN subject matter experts. Peak’s bid was selected following a competitive process and after a review by the Headquarters Committee on Contracts. Peak will coordinate other subcontractors in Germany and China and will provide after sales support, installation and training. UN advisory panels have no relationship whatsoever to UN procurement processes. Below are some follow-ups on the Suntech response you sent yesterday afternoon, also on the $100 million from the US Tax Equalization Fund, and on the Middle East. Thank you in advance. Suntech follow -up 1) yes or no, is it a violation of UN rules/regulations/contract requirements that a vendor not draw attention to the fact that it is a supplier to the UN? yes or no, doesn't the UN have a rule against this, and what is the UN going to do about it? 3) whose idea was it for the UN to purchase "hybrid solar-diesel generators"? what individual in the UN decided that the UN needed to buy these things? 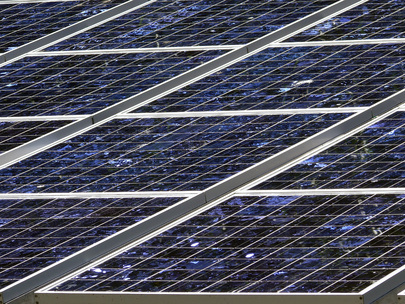 Firms from developing countries are innovating and amassing market share in the field of renewable energy. For instance, Suntech, a Chinese firm, has become a leader on solar PV, based on a combination of its own technologies with that purchased from developed countries. In light of this quote, who were the competitors in the procurement process? On the TEF: 1. Yes or no, has any portion of the $100 million been obligated yet, meaning has the UN entered into a financial commitment for any portion of the $100 million? 2) reiterating: Yes or no, has the Secretary-General notified and received approval from the General Assembly for the acceptance of and authority to spend the $100 million from the US? But on Suntech, nor on the $100 million US tax equalization fund, the UN has provided no answers. If the past is any guide, either no answers will be given, or a generic press release which ignores the questions. Thus does corruption grow. Watch this site. UNITED NATIONS, February 17, updated -- After a large Chinese company Suntech Power Holdings announced it has won a $80 million contract with the UN to supply solar panels to “serve the UN's peacekeeping forces,” Inner City Press asked head UN Peacekeeper Alain Le Roy about the contract. “I am not aware of that,” Le Roy told Inner City Press. At the February 17 UN noon briefing, Inner City Press asked Ban Ki-moon's spokesman Martin Nesirky several questions about the announced contract award: to confirm it (Nesirky could not), and to explain what conflict of interest safeguards there are, since Suntech's CEO Shi Zhengrong is a on Ban Ki-moon's group of Advisors on Energy and Climate Change. Inner City Press asked: how many other bidders were there? 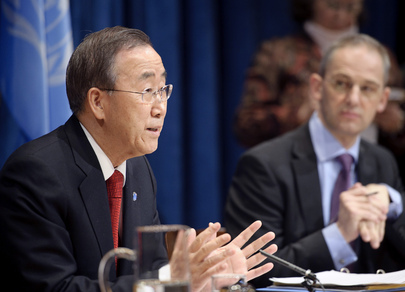 What weight was given to Shi Zhengrong's status with Ban Ki-moon? Nesirky had no answers. While Peak International Trade (Tianjin) IS listed in the UN vendor data base, experts conclude that Peak is a Intermediary Vendor, a structure supposedly disfavored by the UN. So why would the UN allow a non-vendor run by an Advisor to Ban Ki-moon to work around this through an intermediary and announce a $80 million contract with the UN? So was Ban Ki-moon advisor Shi Zhengrong given special rights and waivers? Is has this publicly traded company (STP.NYSE) made a mis-statement? And why can't the UN answer? Watch this site. Update of 6 pm - six hours after the questions were raised, all the UN provided was a list of ACECC members. What about the safeguards? What about the other questions, including those actually raised at the noon briefing? What about the other questions, including those raised at the noon briefing? Inner City Press: it’s on a contractor, this Suntech Power, a Chinese-based photovoltaic company, announced that it has won a $180 million contract from the UN to provide panels, solar panels, I guess, to peacekeeping missions. I wanted to, one, if you could confirm it; it is a pretty big contract. Two, it doesn’t seem, this company doesn’t seem to be listed anywhere in the UN, in the vendor, approved vendor lists. And the CEO is apparently on the Secretary-General’s Advisory Group on Energy and Climate Change. So I am just wondering, were there any — if that’s the case, the final one — were there any precautions taken in the procurement? Were there other bidders? Can we have some presentation of how the contract was given and whether it’s appropriate, the way they announced it, and that they are not a listed vendor? UNITED NATIONS, January 28 -- Rather than admit that UN Secretary General Ban Ki-moon misspoke when he claimed two weeks ago that 99% of his officials have made public financial disclosure, Ban's spokesman Martin Nesirky told Inner City Press on Friday, “I wouldn't get hung up on the ninety nine percent figure as a mathematical absolute, because it is also a metaphorical expression, that nearly everyone” disclosed. Video here, transcript below. The officials not making public disclosure range from Ban' two Sudan envoys Ibrahim Gambari and Haile Menkerios through Rule of Law chief Dmitry Titov to Ban's close ally and envoy to Cote d'Ivoire Choi Young-jin. Nesirky, who on January 21 after Inner City Press asked about the UN's seeming failure to comply with its own Regulation 1.2 said he wouldn't answer any more questions until Inner City Press somehow acted “appropriately,” never answered this e-mail question. At the UN noon briefing on January 28, Inner City Press finally asked Nesirky directly about Ban's statement that 99% of his officials have made public financial disclosure. Nesirky began by dodging the questions, saying that "financial disclosure means to disclose to the United Nations what your assets are and so on. And then it is fully within the rights of the individual to elect or not to elect for that to be publicly disclosed. And I think you will see that in the vast majority of cases, this is publicly disclosed." But Ban specifically used the word “publicly” on January 14, saying that “ninety nine percent of senior advisers of the United Nations have declared their financial assets publicly on the website.” Click here for footage of Ban's claims from a recent piece on Swedish TV including Inner City Press and a FAC hearing witness. This is when Nesirky told Inner City Press, “I wouldn't get hung up on the 99% figure as a mathematical absolute, because it is also a metaphorical expression, that nearly everyone” disclosed. Video here. So at the UN, a claim by Ban Ki-moon that 99% of his officials have made public financial disclosure is just a metaphor. Inner City Press: In his last press conference in here, the Secretary-General said when asked about the [Inga-Britt] Ahlenius book, that 99 per cent of officials have made public financial disclosure. And just having looked at the website of disclosures, it doesn’t, that number is not the number. The number of his officials including Mr. Choi [Young-jin] of Côte d'Ivoire, [Ibrahim] Gambari, [Haile] Menkerios, Said Djinnit, Michael Williams, whom you mentioned, they have all filled out a form saying “we chose not to disclose”. So, I just… I have been trying to figure out, what is the 99 per cent figure based on? Does he include people that say “I won’t disclose” as having made a public disclosure? Or, what is the actual number? Spokesperson Martin Nesirky: Financial disclosure means to disclose to the United Nations what your assets are and so on. And then it is fully within the rights of the individual to elect or not to elect for that to be publicly disclosed. And I think you will see that in the vast majority of cases, this is publicly disclosed. Inner City Press: When he said public, that’s the phrase that he used — he said that 99 per cent of my officials have made public financial disclosures. So, is that… that’s not what he meant? He meant that they have actually… they have made disclosure to the UN? Spokesperson: Well I think also I wouldn’t get hung up on the 99 per cent figure as a mathematical absolute, because it is also a metaphorical expression meaning nearly everyone, okay? Inner City Press: But, Mr. Choi, does he think that Mr. Choi, kind of a close ally, long-time person that he has worked with, does he think that Mr. Choi should publicly disclose? Would he call on him to publicly disclose? Spokesperson: Again, this is a matter for the individuals concerned. Okay, yes? No, not okay. Watch this site.